So, as short and “stevia” sweet as possible, Guru Health was started in February, 2010, by two “Miss” from Calgary with the intent to sell nutritional products, like Whey Protein Powder, as re-sellers. As of May 31, 2011, Vanessa Gillis owned 1.6 million shares (62% of issued and o/s) and Jessica Bradshaw owned 1 million (38% of issued and o/s). In July and August of 2011, Guru Health issued 2 million shares of common stock pursuant to the S-1 offering at $0.01 per share for total cash proceeds of $20,000. So, 4.6 million was the total issued and outstanding. On May 14, 2012, Vanessa Gillis resigned as President and CEO of the Company. Jessica Bradshaw resigned as Secretary, Treasurer and CFO of the Company. Concurrently with the resignations, they appointed Matthew Christopherson (see his LinkedIn profile here) as the Harry Lappa of the Company; President, CEO, Secretary, Treasurer and CFO. On May 31, 2012, Matthew Christopherson agreed with both Vanessa Gillis (see here) and Jessica Bradshaw (see here) to purchase their 1.6 million and 1 million shares respectively for a total of $30,000; $25,000 and $5,000 respectively. Vanessa got the better end of that deal, $0.015625 per share. compared to Jessica’s $0.005 per share. That was supposed to be it. Then, when Matthew Christopherson LinkedIn profile, you can see he has a decent history: 246 connections, a background in microbiology and organic chemistry and attention to work alongside start-up companies. He is co-founder of Sweet Life Stevia, a company focused on large-scale stevia plantation development in Indonesia. (see website we found here) Then the can of worms opens up. Pictured on the right is Matthew “Matt” Christopherson (left), David Clifton (center), and Kevin Mizuno (right). Clifton (see LinkedIn Profile Pic here) has a lengthy track record with OTC listed companies which went to crap that have also been connected directly with Mizuno (see LinkedIn Profile Pic here). Formerly known as Metasun Enterprises, Inc. (OTC: MESU), Clifton was the Director, Officer and Vice President of Pure Biofuels Corp. (OTC: PBOF) in August, 2006. (see here) Pure BioFuels conducted its business out of Peru. David Clifton (see here) is currently listed as a Strategic Advisor with Stevia Nutra Corp. (OTC: STNT), currently in early pump phase, where it claims he is the Founder of Stevia One, the largest single owned stevia plantation in the world. Chistopherson also claims to be one of Stevia One’s co-founders. 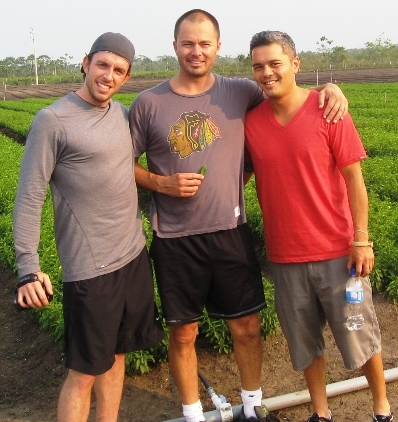 The picture of the three amigos, Christopherson, Clifton and Mizuno, and the ones used currently on Clifton’s STNT profile and his and Mizuno’s LinkedIn profiles was taken at SteviaOne in Peru. Clifton claims to be the Founder according to his STNT profile, but has no reference anywhere on SteviaOne’s website. (see here) Worse than that, Clifton is on numerous documents from his days at Pure Biofuels with Chad DeGroot (see here, here, and here). Chad DeGroot, former President of Metasun Enterprises, is/was the husband to Jessica Jaynes, sister of Jeremy Jaynes, aka Jeremy Dagan Jaynes, aka Jeremy O Jaynes, aka Gaven Stubberfield. Jaynes ran the www.winningstockpicks.net group, aka Worldwide Picks LTD, last decades version of AwesomePennyStocks.com. (see here) Jaynes was sentenced to 9 years in prison, but that was for spamming; he’s never been arrested for stock fraud and he’s never served any time in jail since his case is/was being appealed. However, ties to DeGroot are direct as both his wife and his work have been connected to the crew. Bottom Line: Regardless of the criminal connections and links to various pump and dumps, Global Stevia Corp. still belongs on the list of penny stocks to watch. The ticker symbol will most likely change, so GRUH won’t be the one you see gain 300%+. Stevia has found a home on the stock market and that home is the OTC. Of the companies registered with the SEC with the name “Stevia”, all are currently trading on the OTC. Last updated by Aim High Alerts at July 29, 2012 . STEV | Crops Growing And Money Flowing In Stevia Corp.